As long as they hold up these chairs are fabulous. Had to use a drill for some of the screws as there were not pre-drilled holes. These are on the smaller side but that’s what we wanted. Very happy with this purchase. 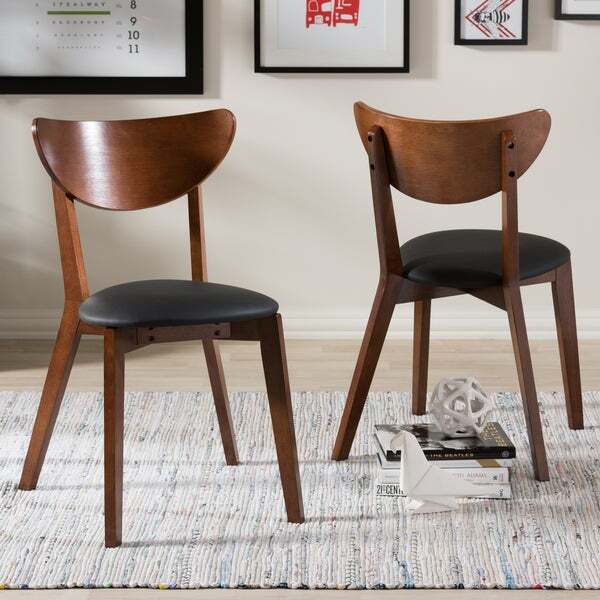 The Haides walnut veneer dining chair absolutely radiates style and a little bit of retro charm. With dainty legs and a flawless silhouette, this is a chair set that will match basically any table, and be at home in any dining room. Haides is a true testament to Scandinavian design - clean, crisp lines give way to curved features and gorgeously finished tapered wood legs. Practical yet stunning, it can find a place in any home. The Haides dining chair set presents itself with a trendy walnut finishing, which is both neutral and eye catching. This luxurious finish emits an air of sophistication, and leaves a smooth, easy to clean surface. Made in Malaysia, the Haides dining chair requires assembly. The chairs are sturdy and comfortable. the faux leather feels thick and sturdy too. love them, they went great with a table I already have. The chairs have a great look. They were fairly easy to assemble, seat cushions need to have pre drilled holes along with side wood brace.